The mission's message and challenge for you today is this: DIG for GOLD that will Last for Eternity. D.I.G stands for Disciple, Intercede, and Give. GOLD stands for Godly, Obedient, and Loving Disciples. Let us Disciple, Intercede, and Give in order to produce Godly, Obedient, and Loving Disciples that will last throughout eternity. The Missions Strategy is to DIG. 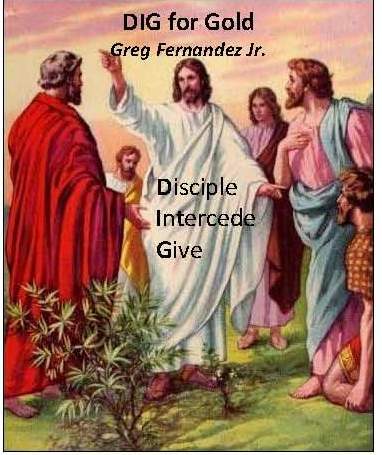 Disciple, Intercede, and Give. The Missions Goal is GOLD. Godly, Obedient, and loving disciples. The Missions Motivation is Eternity. Let me explain. I love being in this world; I enjoy it. I want to live at least more than 90 years or a hundred; but the way I am eating (my diet), though, doesn't seem to allow me to live that long. Let us think about eternity as the motivation to DIG for Gold. There is a danger of losing our sense of eternity because by focusing too much on our earthly responsibility. In 2008, I thought of writing a book with a title Eternity Driven Life. I didn’t write a book, but I did preach a sermon on the same topic. As Christians let us live a life that is eternity driven not earthly driven. It is essential that we think beyond this earthly life. It is easy to become unbalance in our approach to life. There is a danger on focusing too much on eternity without doing our responsibility to make a better society. But there is also the danger on focusing too much on the life here on earth that we forget there is life after death. In his teaching, Jesus emphasizes both-the present life and the afterlife. In the prayer He taught his disciples, Jesus prayed... “Thy kingdom come, Thy will be done on earth as it is in heaven.” This shows the importance of making a difference in this present world-other people call it community transformation. But sometimes Christians can become too unbalance with their emphasis on community development and forget that life on earth is not all that there is. What I would like to do now is for us to understand DIG as circular not linear. It is not a step that we do one after the other..instead, it is something that we do at once-like the mixer or the halo-halo. So I want to discuss this three words at the same time, not one at a time. When you DIG, my appeal to you is to dig wherever you are located-do it where you live. You don’t have to go overseas do missions. You can fulfill the Great Commission of Jesus right where you live or work. If you are a boss, DIG GOLD from your employees. If you are a teacher, think about discipling one of your students. If you are a parent, do it in your home. If have neighbors, do it in your neighborhood. If you have a job, DIG in your workplace. Yes, you can DIG right where you work and you can DIG right where you live. Young people start with your own youth group..your friends.. While you can disciple, Intercede, and give wherever you are, you cannot make disciples where you are not. But when you intercede you can reach the whole world. You can travel around the globe by your intercession. Intercession is unlimited because it is boundless. The same thing with giving. When you give money, you can also reach other places. Your mission offering travels to remote places, crossing cross-cultural barriers and geographical terrains. You can reach us here in Cambodia by your intercession and with your missions offering. You may not be here physically but you can be here with your intercession and offering. In the past, discipleship is limited to where you are. With the advance in technology, you can disciple others online. Let us not think of discipleship only where we are . We can reach out to others through other means. D—DISCIPLE. While missions still the same, the methods changes but the message remains the same-make disciples. Jesus said, Go and make disciples in all nations. Jesus didn’t say, go and disciples of all people. It is impossible to disciple all people in all nations, but it is possible to disciple people in every nation and culture. Discipleship is people oriented. Discipleship is a mission and ministry directed to people, not to a building, not to other things..but people only. You are all aware that we cannot bring our possessions to heaven, but we can bring people with us. The parents here this afternoon, you know you cannot bring your possessions to heaven but you can bring your children with you there. I believe if each one of us will win and disciple one person for the next three years, our Sunday morning attendance will multiply. But let me remind you not to focus too much on statistics. Statistic is important, but there is more important than mere numbers. That is, the transformation of lives! the question then is: What impact are we making in our society for God? Let me get back to the problem of statistics by pointing to the ministry of Jesus on earth. The Lord Jesus discipled only 12 people for 3 years, yet one was a traitor. Although my Bible tells me that Jesus had many disciples, Jesus focused on twelve only. The point I am making is not to think too much about statistics. Statistics have a place, but don’t be an statistically driven. While not forgetting our earthly responsibility, I challenge you to be eternity driven in your approach to ministry. In your intercession, focus on People. Jesus said, The harvest is plentiful but the laborers are few. Pray to the Lord of the harvest to send forth laborers into his harvest field. Matthew 9: 37. Paul told Timothy, that intercession and request be made know to God for all people. Focus on people not simply the material things they needed. When giving, the key word is MAT-Money, Ability, and Time. Other calls this T.T.T - Treasure, Talent, and Time but I call it MAT. This afternoon, I challenge you to give your MAT to God. Let us start with M-Money. Is there a verse in the Bible that giving is eternally rewarded? Matthew 6: 19-21. Luke 12: 33-34. Jesus said, do not store treasure on earth but in heaven. Give your alms to the poor and you will have treasures in heaven. When you give your money to God’s ministry, it becomes an eternal investment. This is not a mad-made promises. It is promised in the Bible. I remind people that while you cannot bring your money when you die, you can send to heaven ahead. Did you get the point? You cannot carry your money to heaven, but you can send there ahead. How, by giving to the poor, to the church, and for missions. But don’t get me wrong. Giving is not only about money but your ability as well. What are your skills and talents? Many of you are gifted but you are not using them. What a waste of talents. Time is another important thing that we can give. Don’t think you cannot dig for gold if you don’t have money. You still have ability and time. Spend time praying. Spend time with people. Pour out your time with others so that they will become better believers. Time is precious so invest it like a precious gold. Give your MAT to others! When you DIG for GOLD, you don’t have to go across the land and sea to do it. My appeal to you brothers and sisters is to DIG wherever you are located. Think with me for a while, if each one of us this afternoon, will DIG for GOLD that will last for eternity, our church will multiply in the next three years. Even if our goal is not for growth, if we truly put effort to DIG for GOLD, our church will surely grow. We will DIG for GOLD not out of Christian duty but because of our love for Jesus and our sense of eternity. God bless you!